Do you ever pre-order a game and then forget about it? I do. Not often, mind you, but every once in a while the release date of a game--even one I've been looking forward to for some time--catches me off guard. Such has been the case with Luigi's Mansion: Dark Moon for the 3DS. I knew it was going to hit store shelves across North America this spring, but until Newegg sent me an e-mail last week saying my order had been shipped, I hadn't realized its release was so near. 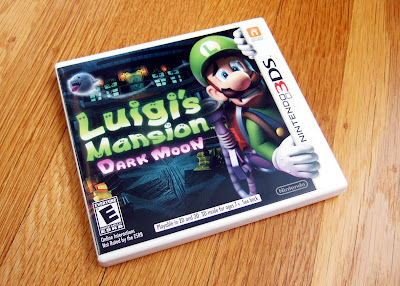 As I'm sure you've already assumed based on the photo above, my copy of Luigi's Mansion: Dark Moon arrived yesterday. Although I've freed it from its cellophane wrapper, I only did so because I know I'll get around to playing it sooner rather than later. Don't expect "soon" to arrive, say, next week, though, as there's no way I'm popping this cartridge into my 3DS until I beat both EarthBound and Fire Emblem: Awakening (my current gaming obsessions). In the meantime, are any of you playing through Luigi's Mansion: Dark Moon? If so, what do you think of it so far? Is your birthday coming up soon, Justin? Regardless, I hope you get it :) I've only read great things about it, and it certainly looks lovely, doesn't it? Hopefully I'll get to it soon. Honestly, I'm in a bit of a gaming rut right now thanks to a number of things. Hopefully I'll snap out of it shortly, finish EB and then move on to Luigi's Mansion, etc. I bought a copy of the game yesterday. I started playing it yesterday and really like it. It's just as great as the Gamecube-title. BTW: I received Monster Hunter 3 Ultimate for the Wii U some days ago. I loved the Wii game "Monster Hunter Tri" and this Wii U "remake" is more like a Add On but I love it. The game still is fun! I've been wanting to play Luigi's Mansion for months, and I will probably buy it up this weekend just to have it, but there's no way I'll start playing it anytime soon. Monster Hunter 3 Ultimate is taking up my gaming time right now (32 hours so far). Wait, did Europe get a Limited Edition of Luigi's Mansion 2, Lizzi, or am I misunderstanding? Also glad to hear you're enjoying MH3U. Just remember that it's basically an upscaled 3DS game, so it's definitely not showing you what the Wii U is capable of in terms of graphics. I'm glad to hear you're really enjoying MH3U, BTW. I've been reading a lot about the game lately, and I'm definitely itching to try some version of MH sooner rather than later. I've been playing Luigi's Mansion: Dark Moon. There are a lot of design decisions I'm not fond of, and the game's just a bit too simple and repetitive for my tastes, but it has charm in spades, and to be fair, I knew full well that I'd have problems with the game going in. Still, I rarely play my 3DS (although Harmoknight's out today!) and I really just wanted something to play and muck around with--and for that, Luigi's Mansion is fun, but it's not a game that's sinking its teeth into me, and I'll probably sell it once I finish. You can't go wrong with MH3U. The new camera controls on the 3DS version are an improvement over the PSP's "claw technique," and you can always transfer your save if you decide to go online with the Wii U version later. And the Limited Edition was 5€ cheaper than the normal one. True. I can't help but wish I could go online with the 3DS version, though. That's the main thing holding me back from picking up that version at the moment. Oh! What design decisions don't you like, if you don't mind me asking? Also, did you enjoy the original Luigi's Mansion, or did you have problems with it, too? I liked what I've played of the original, so I'm hoping I'll like Dark Moon, too. My real concern is whether I'll stick with it to the end or move on when something else more enticing comes my way (as it almost always does). As for HarmoKnight: I think I'm going to pick it up this afternoon even though I really shouldn't be buying anymore games for a good long while. I'm not a fan of the fact that the game is split up into six missions among each mansion. I can see why they did it, as it's a portable game and that seems to be the going trend, but it dampens the sense of exploration, as within each mission, there are only a certain number of rooms that can be entered, whereas I really just wanted to have unrestricted access to explore as I please. By separating the game into missions, it also has a score attack sensibility to it, which is fine, but I'd rather be rewarded with a secret room or discovery of a creepy artifact rather than golden bones and gold bars. I've never played the original as I don't own anything that can play Gamecube games, so this is my first experience with the series (insofar as it can be called one!). Why buy it then? Harmoknight will still be there when you're ready for it. Did you ever finish The Denpa Men? Ah, yes, I've read/heard about this game being split into missions. I don't like the sound of that either :| I'll try to go into it with an open mind, though. I'll let you know what I think after I finally play it. Really, it's completely my kind of game. Plus, I had a ton of fun with the demo. Anyway, we'll see soon enough, I guess! It's called USK and everyone hates it. That's why most people love the games (like some on PS3) which have a reversible cover. But I just love MonHun. Yikes! Isn't 44€ quite a bit of money? I can understand that! Why on earth does it have to be so big?? Ah, that doesn't sound so great--that you really need the CPP, I mean. Yuck! That's nothing most games cost 69 - 79€. And That's way too much (imo). I don't think the CPP is really necessary. Granted I only have ~24 hours in but the touch-pad panel that locks onto the boss monster is all you need - or at least from what I've played so far. Apparently that lock-on can also be re-mapped to the L and R buttons on the D-Pad but I haven't tried that yet. Yes, it's true that the lock-on is really helpful but it doesn't work perfectly all the time. Sometimes it just zooms in some weird directions... But I play the Wii U version and the controller has two sticks so I can control the camera on my own. That works out pretty fine for me.